Kamo"- Little Kyoto" SUBPAGE | All Japan Kyoto Association"
Kamo City is located almost in the center of Niigata Prefecture. The city has long been called a “Little Kyoto in the Hokuetsu region” as its geographical elements are similar to those of Kyoto’s: surrounded by mountains in three directions and with a Kamo River whose origin starts from Mt. Awagadake and runs into the Shinano River. 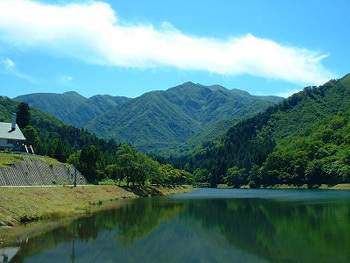 Kamoyama Park, located near the city center, is blessed with rich nature and is loved as a recreation site for local people. The park is also known for beautiful Yuki Tsubaki, or Snow Camellia which showcases splendid blossoms in the heavily-snowy region in winter. Approx. 50,000 camellia trees will be in bloom in the early spring. 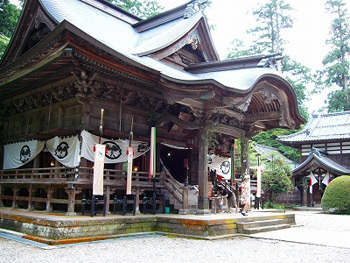 Kamo is famous for the production of traditional paulownia chests (Kiri Tansu). The traditional techniques of the craftsmen and their quality are highly valued throughout the county. Aomi Shrine is an extremely old shrine established in 726 which is mentioned in the official records of the imperial government of those days. When the national capital was relocated to Kyoto, the area became an official property of Kamo Shrine in Kyoto and this was how Kamo City got its name today. Every year on May 21st is the day of the Spring Festival. 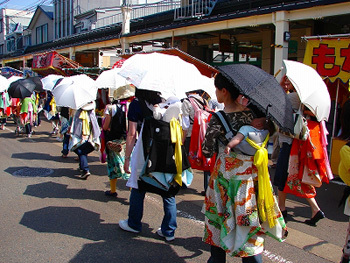 It is also called “Uba (Nanny) Festival” since mothers have their babies dress in special costumes and join a sacred procession. A park where a number of Yuki Tsubaki, or Snow Camellia (the tree of Niigata Prefecture) grow. There are many attractions in the park such as Snow Camellia Garden, Squirrel Park, Forest of Sculpture, a large slide as well as a stone monument of a famous song, “Snow Camellia” by Sachiko Kobayashi, a famous Japanese singer from Niigata Prefecture. Visitor center, campsite, herb garden, natural forest and many attractions where people can enjoy the natural surroundings and relax. There is a charcoal burning hut where visitors can try burning charcoal. Hera-buna carp fishing, botanical garden of hygrophilous plants, dragonfly ecosphere, learning center about nature and many other attractions welcome people. 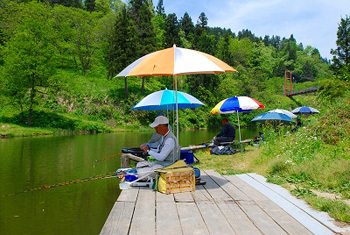 Especially popular is the hera-buna carp fishing and a number of fishing lovers come to enjoy from around and outside of the prefecture. Oldest wooden train in Niigata Prefecture, “Moha #1,” semi-steel train “Moha 61,” electrical locomotive “ED1” are exhibited at the site. The Rose Garden and flower clock are beautiful to visit. 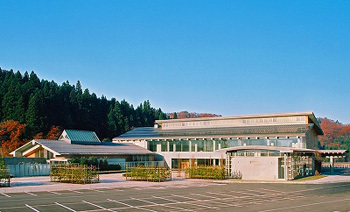 An onsen hot spring for a day-trip. 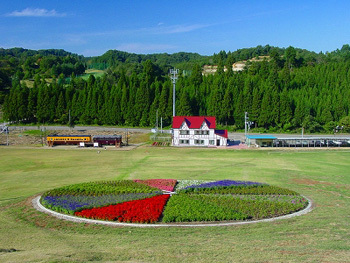 People can enjoy a superb view of Mt. Awagatake while bathing. The natural hot water consists of a number of effective substances for health, such as good for nerve pain, chronic skin problems, high blood pressure, arterial stiffening, etc. There is a large common space for having a rest and a souvenir shop, too. Access A 20-min. by car from JR Kamo Station. Free shuttle bus service available. Only three minutes on foot from Kamoyama Park, people can enjoy discovering a variety of souvenirs from Kamo City including local sweets, paulownia crafts, cotton woven textiles and more. 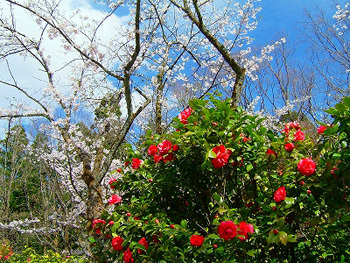 A spring festival held in Kamoyama Park where a number of Yuki Tsubaki (Snow Camellia) grow. 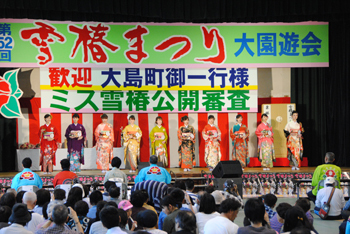 “Miss Yuki Tsubaki” beauty contest, singing show, Yuki Tsubaki Marathon and many other events will be conducted. A large tea ceremony party is held in the early spring. A spring festival of Aomi Shrine which was founded in 726. The shrine is worshipped as the deity of safe child delivery and child raising. Mothers have their babies dress in special traditional costumes and join a sacred procession, therefore, the festival is also called Uba (Nanny) Festival. This festival is also called “Dango (sweet dumpling) Festival” since it is held around the time when Sasa Dango (sweet dumplings wrapped with a bamboo leaf), a signature sweet of Niigata, start to be sold in the area. 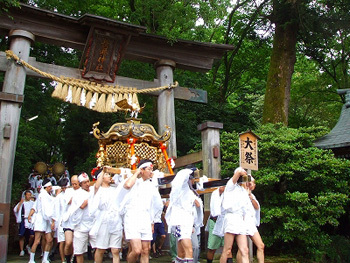 During the Shinko Procession, an unusual hexagonal mikoshi portable shrine will parade around the city. 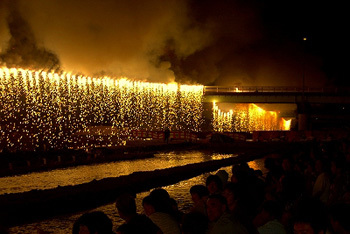 A large-scale summer festival held by the Kamo River bank. Main highlight is gorgeous fireworks at the end of the festival. Huge Niagara Fireworks which expands to 2 km long adorn the night sky above the Kamo River as if it is a shower of colorful lights. Kamo City is the top producer in Japan of quality Kiri Tansu paulownia chests (70% of all paulownia chests in Japan are from Kamo City). 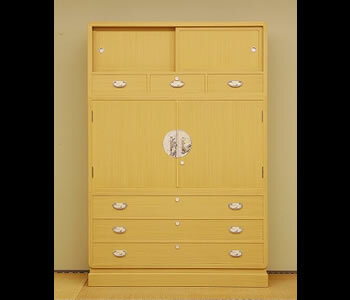 Paulownia chests are regarded as the finest quality furniture due to the warmth of the wood, silky white shimmer and beautiful straight wood grains and color. It was designated as the Traditional Craft of Japan by the Minister of Economy, Trade and Industry on December 15th, 1976. 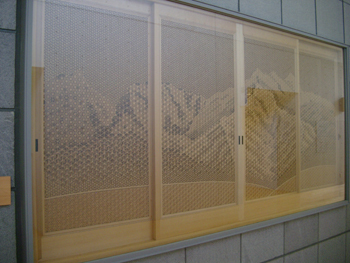 Traditionally, folding screens, or byobu, were an essential furniture in a Japanese house for blocking wind coming into the house and people looking in from outside as well as for decorative purposes. 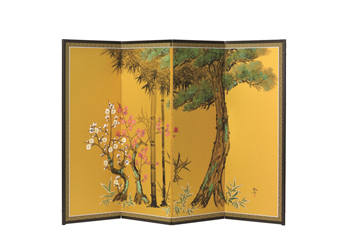 Kamo is very famous for the paulownia chests and folding screens are yet another main craft; 90% of folding screens in Japan come from Kamo City. Kamo City was already well-known as a production area of traditional Japanese mounting furniture since the late Edo period (1818-1831). Recently they produce “Kamo Sash” which is a sash made of wood. 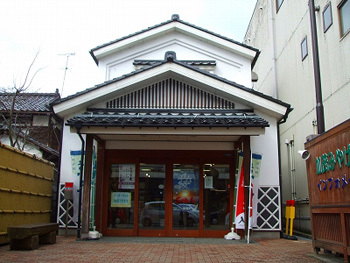 Sake breweries in Kamo City produce quality Japanese sake many of which won awards in different competitions. There are many popular local sweets from Kamo City: Yuki Tsubaki, Karls (cracker), Hoine (sweet dumpling), Karinto (sweet fried cookie) and more. Fruits from Kamo City are highly praised; Niitaka nashi (Japanese pear), Le Lectier (Western pear) and jelly using Le Lectier are particularly popular.